An original C.1750 French European Hunting Hanger Sword. This type of hunting sword was common throughout Europe in the 18th Century although the style of the sword hilt probably indicates a French origin. The sword comprises a brass D-shaped hilt with a swollen knuckleguard, engraved crossguard and upturned quillon. The grip is made from horn and topped with a domed pommel. The blade is plain and with a single fuller to the top of the blade. 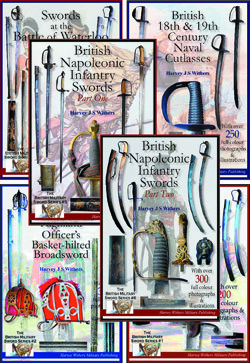 These swords were used both in the hunting field and also carried by military officers, particularly naval officers, where the shorter blade was an efficient weapon on board the confines of a ship's deck. The sword shows signs of wear, particularly towards the end of the blade. Blade length is 21.5 inches (26 inches overall).